Pain and dentistry go hand in hand, as it is one of the most common elements that bring the patient to a dental healthcare provider. According to International Association for the Study of Pain, pain is defined as “An unpleasant sensory and emotional experience associated with actual or potential tissue damage or described in terms of such damage.” Pain can either be acute or chronic depending on the duration and the severity of pain. Acute pain is an attention-seeker, which will force the individual to seek a healthcare professional to alleviate pain immediately, whereas management of chronic pain is often viewed as a low priority among healthcare providers as it is considered as complicated, time-consuming, and often ineffective. Musculoskeletal disorders are the most common cause of chronic pain experienced by adults. In the orofacial region, the term temporomandibular disorders (TMDs) is a collective term embracing a number of clinical problems that involve the masticatory muscles, the temporomandibular joints (TMJs), and associated structures, or both. These disorders are characterized by pain at the TMJ, generalized orofacial pain, chronic headaches and ear aches, jaw dysfunction, including hyper- and hypo-mobility, limited movement or locking of the jaw, painful clicking or popping sounds with opening or closing of the mouth, and difficulty in chewing or speaking. The treatment modalities of TMJ pain include conservative and surgical management. The initial management of TMJ pain with surgical intervention would result in both physical and mental trauma to the patient. Hence, the forefront management of TMJ pain is through conservative approach, which includes resting the jaw, relaxing the jaw muscles, and jaw exercises as recommended by physical therapist along with dietary modifications and analgesics. When all the conservative management techniques have failed or no significant outcome is obtained, prolotherapy can be an effective modality. Prolotherapy is a new novel approach for the treatment of TMDs apart from conservative and surgical management that has been gaining popularity in dentistry. Prolotherapy, as defined by Webster's Third New International Dictionary, is “the rehabilitation of an incompetent structure, such as a ligament or tendon, by inducing the proliferation of cells.” The word “Prolos” means growth. Prolotherapy injections cause proliferation or stimulation of growth of new, normal ligament and tendon tissue. Of late, in 2007, Reeves defined prolotherapy as an injection of growth factors or growth factor production stimulants to grow normal cells or tissue. Around 2500 years ago, Hippocrates treated athlete's shoulder instability by promoting healing through inflammation and strengthening of capsule of the shoulder using a red-hot needle Cautery. In the 1930s, Louis W. Schulz described the strengthening method of the TMJ capsule by irritant solutions. 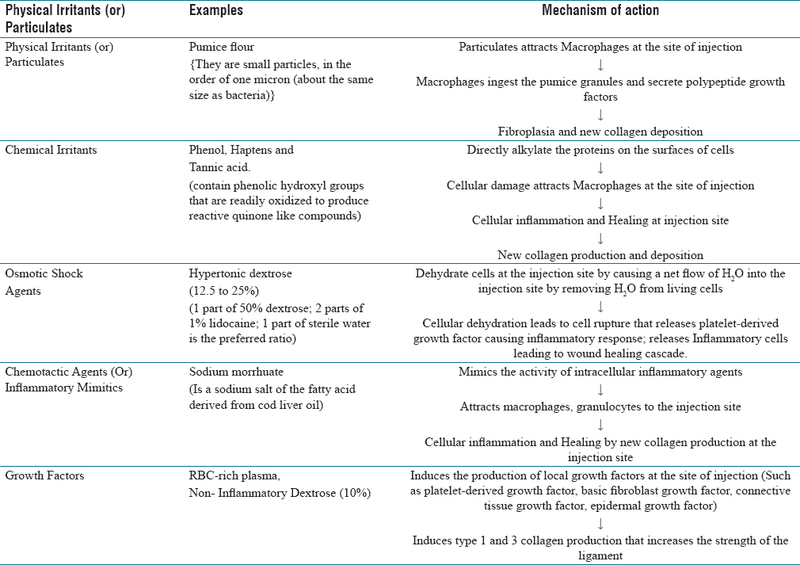 The mechanism of action of prolotherapy is based on “inflammation secondary to injury” that initiates the biological process of wound healing [Figure1]. Growth factor stimulation prolotherapy: injection of certain substances induces the body to produce growth factors, for example, non-inflammatory dextrose (10%). Human cells exposed to 0.3% dextrose can produce the growth factors such as platelet-derived growth factor, basic fibroblast growth factor, connective tissue growth factor, epidermal growth factor, and transforming growth factor-beta. Inflammatory prolotherapy: the inflammatory signals that result from solutions have a growth factor stimulation effect, but they cause a more vigorous response, for example, 12.5%–25% dextrose, sodium-morrhuate-containing solutions and phenol-containing solutions. It is an inexpensive medical technique for stimulation of the natural wound healing cascade. The preferred patient position is supine or reclined posture to provide stability to head and to decrease the risk of syncope. The head is turned to the opposite side away from the injection site. Before administering injection, the anatomic landmarks are marked after cleaning the related skin area with appropriate antiseptic. A 3-cc syringe with 30-gauge needle and 1-inch length is preferably chosen [Figure 2]a. Access to the superior joint space is achieved by asking the patient to close the anterior teeth on a small bite block or 2 thickness of dental cotton rolls which enables translation of the mandibular condyles down to the glenoid slope of the anterior fossa [Figure 2]a. The needle is penetrated on to the skin midway between tragus of ear and posterior aspect of condyle [Figure 2]b. It is then directed superiorly and anteriorly toward the apex of the fossa into the superior joint space where a contact is established with the periosteum. When a contact is made with periosteum into the joint capsule, a slight momentary resistance is felt. If excessive resistance is felt, then the needle is withdrawn slightly and redirected to ensure that the injection is superficial to but in contact with periosteum [Figure 2]c and [Figure 2]d.
The second target is an area where the disc attaches to the superior portion of the lateral pterygoid muscle that commonly produces spasm in chronic disc displacement. Strengthening of the tendinous attachment of the muscle to the disc is accomplished by injecting the solution. The anesthetic component of the solution allows the disc to reposition itself over the condyle and often produces an immediate reduction in TMJ clicking. The injection site is observed for bleeding after needle withdrawal. Generally, the bleeding is minimal and direct pressure stops the bleeding within seconds. A similar procedure is repeated on the opposite side if it is affected. The patient is allowed to rest for a short interval. The pulse is recorded. Patient's comfort is assured and reappointment is scheduled. Early prolotherapy injections were given at weekly intervals, but there was no evidence of benefit from more frequent injections. A common prototypical schedule is to inject 3 cc of the solution at second, fourth, and sixth week intervals, over a total of 12 weeks. Fibrous tissue proliferation may continue as long as several months following the injections. Post-injection morbidity following prolotherapy is more likely to result from faulty injection techniques rather than from the proliferant solutions. Speech may be altered until the anesthetic effect is worn-off. Anxious patients occasionally report dizziness and are at risk of syncope, which can be minimized by supine positioning of the patient during the procedure. Acetaminophen and opioid analgesics can be prescribed for the post-injection discomfort and to help manage coexistent pain disorders. To enhance recovery as an adjuvant to other treatment procedures such as oral appliances. Prolotherapy can be used in refractory cases treated with medicines and where no satisfactory improvement is attained through physiotherapy or any other conservative modes of managements in TMDs. Although prolotherapy has been there for more than a decade, its implications in TMDs have not been highlighted much in dentistry when compared with other musculoskeletal joints. Further studies with more sample size have to be conducted to decide its effectiveness in treating TMDs. Greenberg MS, Glick M, Ship JA. Orofacial pain. In: Petrice C, editor. Burket's Oral Medicine, 11th ed. Ontario: BC Decker Inc.; 2008. p. 257-87. Jeelani S, Krishna S, Reddy J, Reddy V. Prolotherapy in temperomandibular disorders: An overview. Open J Dent Oral Med 2013;1:15-8. Hauser RA, Lackner JB, Steilen-Matias D, Harris DK. A systematic review of dextrose prolotherapy for chronic musculoskeletal pain. Clin Med Insights Arthritis Musculoskelet Disord 2016;9:139-59. Kumar AV, Jaishankar HP, Kavitha AP, Naik PR. Prolotherapy: A new hope for temporomandibular joint pain. Indian J Pain 2013;27:49-52. Vankdoth S, Reddy AS, Talla H, Vijayalaxmi N, Madhulatha G. Prolotherapy – A venturing treatment for temporomandibular joint disorder. IJSS Case Rep Rev 2014;1:27-30. Reeves KD, Hassanein K. Randomized prospective double-blind placebo-controlled study of dextrose prolotherapy for knee osteoarthritis with or without ACL laxity. Altern Ther Health Med 2000;6:37-46. Trescot AM. Everything old is new again: Tech Reg Anesth Pain Manag 2015;19:14-8. Alderman D. Prolotherapy for golf injuries and pain. Pract Pain Manage 2008;1:56-64. Rabago D, Slattengren A, Zgierska A. Prolotherapy in primary care practice. Prim Care 2010;37:65-80. Hakala RV. Prolotherapy (proliferation therapy) in the treatment of TMD. J Craniomandibular Pract 2005;23:1-6. Rabago D, Yelland M, Patterson J, Zgierska A. Prolotherapy for chronic musculoskeletal pain. Am Fam Physician 2011;84:1208-10. Hauser RA, Hauser MA, Blakemore KA. Dextrose prolotherapy and pain of chronic TMJ dysfunction. Pract Pain Manage 2007;1:49-55. Refai H, Altahhan O, Elsharkawy R. The efficacy of dextrose prolotherapy for temporomandibular joint hypermobility: A preliminary prospective, randomized, double blind, placebo-controlled clinical trial. J Oral Maxilofac Surg 2011;69:2962-70. Zhou H, Hu K, Ding Y. Modified dextrose prolotherapy for recurrent temporomandibular joint dislocation. Br J Oral Maxillofac Surg 2014;52:63-6. Hakala RV, Ledermann KM. Wonder why? The use of prolotherapy for temporomandibular joint dysfunction. J Prolother 2010;2:439-46.